Exceptionally precise yet almost unbreakable, the PENTAX Marine was developed for especially demanding conditions. Its oil-filled compass is built into the eyepiece, and an advanced stabilisation system reduces unwanted vibration when viewing. Bearings are clearly readable in 1 degree steps, and the rangefinder reticle allows easy distance cal- culation of known objects. The first number in the product name is the magnification. The MARINE 7x50 Hydro for example, offers 7 times magnification, making your subject appear seven times larger compared to the naked eye. Normally, the higher the magnification, the narrow- er the field of view. Continuous observation for long periods is best with magnifications up to ten times, any higher and keep- ing the image steady becomes less easy. The diameter in mm of the front lens of the binocular, and the second number in the product name, so the MARINE 7x50 Hydro has an objective lens diameter of 50mm. The larger this number is, the better the light gathering power of the binocular, particu- larly important for low light viewing. 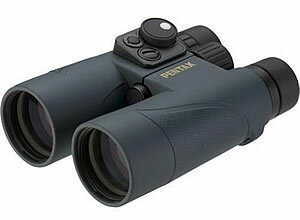 Binoculars with larger objective lens diameters are normally heavier, more bulky and costly. The eyepoint is the distance between the viewers eye and the eyepiece lens, measured in mm. The larger this number is, the more comfortable the binocular for spectacle wearers. For a pair of semi-compact binoculars the eyepoint should be between 14 and 18mm, whilst for a full size pair such as the MARINE 7x50 Hydro, an eyepoint of between 15 and 20mm is usual. Spectacle wearers should insist on an eyepoint of at least 17mm to see the complete field of view. To improve the overall transmission and resolu- tion, lens-coatings are used to reduce reflection and any loss in contrast. With the use of Super Multi Coated lenses, PENTAX achieves high effi- ciency, allowing light transmission of up to 98%! The PENTAX SMC coating is a complex and so- phisticated 7-layer coating that corrects light transmission over the full light spectrum. The patented PENTAX SMC technology is renowned in the optical industry. Magnification 7x, Objective Lens Diameter 50mm, Type Full size roof prism binoculars, Lens coating All lenses fully multi coated, Prism BaK4 with Phase Correction Coating, Twilight factor 18.7, Field of View (at 1,000m) 116mm, Minimum focus 3.0m, Exit pupil 7.1mm, Eyepoint 17.6mm, Eyecups fully adjustable, Tripod adaptor No, Size (LxWxH in mm) 175x134x62, Weight (g) 976, Accessories Case, strap.